The world you live in today is a very troubled world. You not only have your own personal problems, but you also suffer from the deliberate OPPOSITION and ANTAGONISM of the world around you. First, understand this: If the WORLD today is not happy — if world conditions are in a chaotic state, if lives are empty and purposeless, if minds are filled with fears and worries, bodies wracked with sickness and disease — THERE IS A REASON! Conditions are exactly what we make them! WE, TOO, AS GOD'S PEOPLE, HAVE LESSONS TO LEARN. Even though stubborn and rebellious mankind brings upon the world even DARKER days in the immediate future, REMEMBER — it's DARKEST just before DAWN. Take hope in the SURE knowledge that the new world of GOD'S making and RULING — is VERY near today! But in the meantime, what about You and your own private life and problems? Let us consider some of your own private, personal TROUBLES. I know that you have them! And I want to tell you something — I want to tell you GOOD news. YOU are carrying, a lot of worries and fears and troubles that you don't need to carry! Life is simply filled with private, personal battles. We have to battle fears and worries. Sometimes it seems we have to battle PEOPLE who appear to be enemies — often it's a husband, a wife or a mother-in-law — and whether you realize it or not, You also have to battle YOURSELF! It is like having to fight a host of ENEMIES — all these TROUBLES, these CIRCUMSTANCES, these adverse CONDITIONS, these TEMPTATIONS! But there is a way you may FREE yourself from these troubles that confront you. There is a WAY OUT! YOU can be FREE from fighting all of these enemies except just ONE — your own self — and you can receive a lot of HELP and KNOWLEDGE and POWER in doing that! The eternal Creator — RULER of the universe — the God who gives you the very air you breathe — sent His own begotten SON, Jesus Christ, into this world more than 1,900 years ago to BRING YOU THE WAY OF DELIVERANCE from all your trials, your worries, your problems. WHY, then, do some of you not LISTEN to the way He taught us? And WHY do so many people think of Him as a dead Christ hanging on a cross? GOD ALMIGHTY RAISED HIM FROM THE DEAD! Jesus Christ is our LIVING Savior and High Priest, just as the Creator is a LIVING RULER OF ALL THE UNIVERSE! Do YOU REALIZE THAT JESUS CHRIST, THE LIVING, RESURRECTED CHRIST, TO WHOM IS GIVEN ALL POWER, HAS A PRESENT MISSION TO PERFORM? Do you realize that His present mission is to FIGHT YOUR BATTLES FOR YOU — to DELIVER YOU — to FREE you from all your fears, your TROUBLES and even the circumstances that beset you? Thousands of you would come to me for help in your troubles if I had time to see and talk to you — you'd come with husband-and-wife troubles, funeral troubles — every kind of trouble. Yes, you'd come to me because I'm human — one you can see — whose voice you hear. But because I'm only human, I have not the ability, the strength nor the TIME to render such a personal ministry to so many in different parts of the world. Now think this over carefully, and ANSWER THIS! WHY do you fight your own battles, when HE — the LIVING Savior — is living in ALL POWER to fight them for you? WHY? There is one of two reasons, Either you have not fully KNOWN of this great, all-encompassing DIVINE SOURCE OF POWER that you can call on at will — you have not REALIZED what ALL-CONQUERING HELP you can have — or else you have, through lack of faith or neglect, FAILED to CALL ON that supernatural HELP in your times of need! CAN I open your eyes to see that God is a God of LOVE — that God in all His supreme power wills above all things for you to PROSPER and BE IN HEALTH and to find the way to the HAPPY, FULL, ABUNDANT LIFE? That Jesus Christ is a LIVING SAVIOR, to whom you can go AT ALL TIMES — a Savior to save you from your present everyday fears and worries, adverse circumstances, troubles, sicknesses and trials, as well as to save you from eternal DEATH at the end? Notice what Scripture commands: "Let us therefore come boldly to the throne of grace, that we may obtain mercy and find grace to help in time of need" (Hebrews 4:16). God's salvation is NOT something you collect only after you die. IT IS A PRACTICAL, COMMONSENSE, USEFUL salvation that starts in your everyday life RIGHT HERE AND NOW! What needless pains some have been suffering. What NEEDLESS fears and worries you may have been carrying around. What WONDERFUL TIMES — what HAPPINESS you may have cheated yourself out of, just because you have not REALIZED and taken advantage of the very PRESENT and all-powerful HELP of your LIVING Savior! Actually what is happening is that you may have found yourself faced with foes far more powerful than you. These foes may come in forms of troubles, of unforeseen circumstances, of worries, of sicknesses or even of other persons. These foes NEED not make your life unhappy. Did you ever really think through the full meaning of I Corinthians 10:11 that the incidents in the lives of God's people of Old Testament times were written into the Bible for OUR LEARNING AND HELP? Once you UNDERSTAND, you will have to learn to TAKE GOD AT HIS WORD — TO CALL UPON GOD IN PRAYER — you will have to ASK GOD for what you need — and you may have to learn how to PRAY. GOD ALMIGHTY will actually intervene in your life and help you and fight YOUR battles for you. Remember, God is no respecter of persons. He will not do more for one than another. He will do as much for you as for any person who ever lived. He will do as much for you — if you obey Him and rely on Him — as for any ancient king of Israel or Judah! You may have a problem that completely overwhelms you. You may be at your wit's end — you may not know where to turn or what to do! 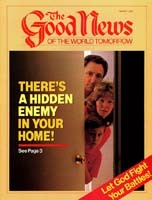 It may be a family problem, a personal problem, a financial problem, a problem of sickness or disease. But let me tell you now as Jesus Christ's apostle of a man who came upon a situation probably far more terrifying than yours — one that would throw fright and terror into the stoutest heart. The solution this man used will solve YOUR problems — put an END to your troubles. The same God who heard and delivered him will hear and deliver you — IF you will obey Him and trust Him. The fact that this man was an ancient king makes no difference. God is no respecter of persons — He will do as much for you. God is the SAME today and tomorrow as He was yesterday. This man was King Hezekiah of the ancient kingdom of JUDAH. He was an ordinary human mortal, the same as YOU today. The vast armies of Assyria were marching westward and southward to invade Judah. The Jews were greatly outnumbered. They had no army or power to stand up against such a powerful foe. They were HELPLESS. They faced certain defeat — just as You may feel HELPLESS in the face of your troubles today. If some of you try to solve your problem or overcome your bad habits or resist sin in nothing more than your OWN power and strength, you, too, will find yourself outnumbered, overpowered and doomed to defeat! You must learn, as this ancient king did, that GOD stands ready and willing to fight your battles for you. "It was after this, after all this loyal service, that Sancherib king of Assyria invaded Judah, besieging the fortified towns and meaning to seize them. When Hezekiah saw that Sancherib had come determined to attack Jerusalem, he and his nobles and his chiefs agreed to stop the water of the fountains outside the town… . "Then, appointing officers over the citizens, he gathered them in the open space at the gate of the city, and encouraged them. 'Be firm,' he said, 'be brave, be not daunted nor dismayed for the king of Assyria or for all his host; we have with us One greater than all he has; he has a mortal force, but we have with us the Eternal our God, to help us and to fight our battles' " (verses 1-3, 6-8). Continuing: "His officers said even worse things against God the Eternal and his servant Hezekiah. (Sancherib also wrote letters, insulting the Eternal the God of Israel and attacking him thus: 'As the gods of the nations elsewhere in the world have failed to save their folk from me, so shall Hezekiah's God fail to save his folk.') The officers shouted aloud in Hebrew to the citizens of Jerusalem on the walls, to terrify them and scare them, that they might capture the city. They talked about the God of Jerusalem as one of the gods of the nations on earth, mere handmade idols" (verses 16-19). Now notice what the king of Judah did: "King Hezekiah and the prophet Isaiah the son of Amoz PRAYED over this and cried to heaven" (verse 20). They PRAYED for help. They did not know exactly HOW God would intervene. But they knew God would ACT! Here's what happened: "Then the Eternal sent an angel who swept off all the gallant fighters, the leaders, and captains, in the camp of the king of Assyria, till he had to go home in disgrace. He [later] went into the temple of his god, and there his own offspring murdered him with their swords. So the Eternal rescued Hezekiah and the citizens of Jerusalem from Sancherib the king of Assyria as well as from all other foes, protecting them on every side"(verses 21-22). That experience was written into the very WORD OF GOD for your learning and to SHOW YOU THE WAY TODAY! Perhaps You are faced with a foe more powerful than you. It may be some TEMPTATION. It may be some circumstance or condition or trouble. Some serious WORRY. Then let me ask you, WHAT ARE YOU RELYING ON to withstand the siege of this trouble — to deliver you from it? What do some of you do when some fear, worry, trouble comes up against you? Do you not first FEAR AND WORRY, and then either try to RUN FROM this trouble or else try to meet it in your own power and strength — with your own thinking and planning and doing? Did you never realize that the very CREATOR who caused you to be born — who gives you the life you have — who called you into His truth — is able and anxious to fight all these battles for you just as He did Hezekiah's — if you will only turn to Him and ask Him for wisdom and guidance, RELY on Him and TRUST Him with the result? I know of a lady who, when in her middle 20s, had a problem that was MOST SERIOUS in her life. Three times this girl had been disappointed in love. She had at last been tempted to marry a man she had no right to marry. She brought her problem to me, as God's representative. I found she was looking ONLY AT PHYSICAL APPEARANCES. She reasoned that, so far as she could see, if she obeyed God and refused to marry this man, she might never be married. I counseled her to OBEY GOD — to stop looking at the material circumstances and using human reason to disobey God. I counseled her to do, first of all, WHAT GOD INSTRUCTS IN THE BIBLE, and then to TRUST HIM for the outcome. But that girl did not RELY ON GOD — she relied on her human reason. She obeyed impulse and temptation and married the man. He left her to commit adultery with another woman on their very wedding night. Her life became miserable, terribly unhappy. Then at another time, another similar case was brought to me. THIS young woman rejected the temptation — she obeyed God and RELIED ON THE ETERNAL to work out circumstances — she trusted HIM with the result. Her faith was tried and tested. God did not answer AT ONCE — but in due time, just the RIGHT man came into her life, they fell in love, they were married and GOD HAS BLESSED THEIR MARRIAGE WITH SUPREME HAPPINESS. If you will let GOD have HIS way in your life, then you will have begun to learn how to let Him fight your battles, solve your problems and deliver you from so many troubles you are suffering. "It was after this that the Moabites and Ammonites, with some of the Meunim, made war on Jehoshaphat. Word came to Jehoshaphat that a huge host was moving against him from Edom, over the Dead Sea, and that they were already at Hazazon-tamar (or Engedi). Jehoshaphat was afraid" (II Chronicles 20:1-3, Moffatt). "He resolved to have recourse to the Eternal, and proclaimed a fast all over Judah. So Judah assembled to seek help from the Eternal; people came from every town in Judah to worship the Eternal" (verses 3-4). Jehoshaphat did exactly what God wants you to do today when faced with any temptation or trouble — HE TOOK IT TO GOD IN PRAYER AND FASTING! And as he continued to ask God for help, he said (verses 6-10): "O Eternal, the God of our fathers, art not thou God in heaven, and ruler of all realms on earth? Such power and might is thine that no one can resist thee. O our God, didst not thou evict the natives of this land before thy people Israel, giving the land to the offspring of Abraham thy friend, for all time? And they settled in it, they have built a sanctuary in it to thine honour, thinking that if evil befell them, the sword in judgment, or pestilence, or famine, they would stand in front of this temple and before thee (for in this temple is thy presence) and cry to thee in their distress, till thou didst hear and save them. "Now here are the Ammonites and Moabites and folk from mount Seir, whom thou didst not allow Israel to invade, when Israel came out of the land of Egypt — no, Israel turned away from them and did not destroy them!" But notice what the king said to God: "Look how they reward us, coming to eject us from thy very own country which thou given us to be ours. O our God wilt thou not deal with them? We are helpless against this mighty host that is attacking us; we know not what to do, but we look to thee" (verses 11-12). "After this counsel to the nation, he appointed the Eternal's singers to praise him in sacred vestments, marching in front of the army and chanting, Give thanks to the Eternal, for his kindness never fails. "As they began to sing and praise him, the Eternal set men in ambush against the Ammonites, the Moabites, and the folk from mount Seir, who had attacked Judah, and they were routed. The Ammonites and the Moabites turned on the natives of mount Seir, determined to wipe them out." They turned against one another! That is how God answered Jehoshaphat. "And then, after destroying the natives of Seir, they all helped to kill one another. So when the men of Judah reached their post of attack looking over the open country, they saw the host were so many corpses stretched upon the ground; not a man had escaped" (verses 23-24). Jehoshaphat did not merely leave this trouble with God and then do nothing about it himself. First, he prayed and asked for wisdom, guidance and HELP. Then he DID WHAT GOD SAID. He had to do HIS PART but the BATTLE WAS GOD'S, and Jehoshaphat did not try to fight God's battle. He merely did his own part. But he BELIEVED God, and RELIED on God. The point I want you to REMEMBER is that YOUR battles are not really yours, but GOD'S. If you look to Him, He makes them His battles, and HE fights them for you. How FUTILE for you to try to fight God's battles for HIM. God says, "Many are the afflictions of the righteous, but the Lord delivers him out of them all" (Psalm 34:19). In the New Testament we read, "By GRACE are ye saved through FAITH" (Ephesians 2:8, Authorized Version). Yes, but the FAITH that saves us is a living faith that is practical — it WORKS — it really RELIES on God! So PUT IT TO PRACTICE! God does not promise us an EASY time during this life in this world. But He DOES promise to fight our battles for us to deliver us from EVERY trouble and affliction. WILL YOU LET HIM DO IT, AND LEARN HOW HAPPY YOUR LIFE MAY BECOME? GOD HELP YOU TO UNDERSTAND!